Guest Post by Derek Koch. Originally on thenewshiteboard.com. This weekend, Connecticut’s entrepreneurial community descended on Stamford and transformed it in to a startup lab during Stamford’s first ever Startup Weekend. Twelve new startup teams emerged, and five of those teams were given special honors. At a time when jobs and the economy are on everyone’s mind, these teams took action. Startup Weekend Stamford saw about 40 pitches delivered Friday night; 12 teams formed, and worked throughout the weekend at the Stamford Innovation Center, and down the road at UConn’s Stamford campus. Senator Blumenthal addressed the crowd on Sunday night, and stressed the importance of the work of entrepreneurs to the future of Connecticut. What is Startup Weekend? Simply put, it’s a 54-hour event where developers, designers, and startup enthusiasts come together to form teams and launch companies. The event culminates in a final pitch competition, and a winner is crowned. I was lucky enough to serve as the Facilitator for the weekend, guiding local organizers and teams through the process of formation and the weekend of work. 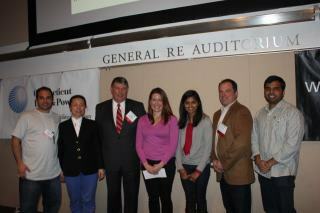 1st Place: MyStuDebt (Michelle Laviree and Amee Patel, @mystudebt): Helping students manage and repay their loans. 2nd Place: Be Beautiful (Katherine Yarborough): BeBeautiful is an online clothing exchange where women can buy and sell clothes and be a part of an online wellness community. 3rd Place: Agricomm Weather (Linda Woods, #Agricomm): AgriComm Weather is a fully-customizable weather dashboard, created specifically for the agricultural commodity market. – Risknicity (Greg Berg, #Risknicity):Making buying car insurance as easy & as social as sharing photos on Facebook. – Love Squadron (Kip Steele, #LoveSquadron) Service that allows you to ask your friends to help you plan the perfect date. Challenge Good [PM: Jessica Lokaj, #ChallengeGood, #GoodRules] ChallengeGood is a social fundraising platform designed to help you achieve your personal goals while raising money for a good cause. Enerknol [PM: Henning Seip, @enerknol] EnerKnol will provide decision support for energy traders and investors, allowing them to access energy policy data from a single website. This will help to manage uncertainty risk, while saving money on the high costs of research and consulting. Gabinja [PM: Sarah Krikorian, @Gabinja_USA] An online platform that connects Korean corporations with highly-trained American native English speakers to provide multidimensional, industry relevant evaluation and continuous monitoring of employee English abilities. Palobo [PM: Jeff Benson, #palobo] Palobo is crowd-sourced product creation. Palobo is where you help bring new products to market by placing pre-production orders or contributing. But you also get your own personal web link to promote and sell products to others and earn commissions. The SuperHero Academy [PM: Karleen Leveille, @KLLearning] We are building games for special needs children that includes a component for parents and Occupational Therapists to monitor progress and pinpoint issues. Webcard [PM: Alex Virvo, @WebKard] Web Card: A page about you and what you do. To all the mentors, speakers, and judges who participated, thank you. And to all the participants in the weekend, you did great work – we’re all excited to see what you do next.